this package extracts sentiment and sentiment-derived plot arcs from text using three sentiment dictionaries conveniently packaged for consumption by R users. Implemented dictionaries include syuzhet (default) developed in the Nebraska Literary Lab, afinn developed by Finn Arup Nielsen, bing developed by Minqing Hu and Bing Liu, and nrc developed by Mohammad, Saif M. and Turney, Peter D.
Darkest sentiments can be seen at the end of the book, where the tragedy reaches its highest level. It is also nice to see how sentiments are cyclical. This graphs can be very useful for people who just want to read happy endings books (my sister is one of those). Inspired by this analysis, I have done another experiment in which I download a book from Project Gutenberg and measure sentiment of all its sentences. Based on this measurement, I filter top 5% (positive or negative sentiment) sentences to build tweets. I have done a Shiny app where all these steps are explained. The app is available here. This is the code of the experiment. p("After that, choose the sentiment of tweets you want to generate. There are four possible methods than can return slightly different results. sentence is extracted as well as a link to my blog and any other string you want. Clicking on the lower button you will get after some seconds a tweet below. 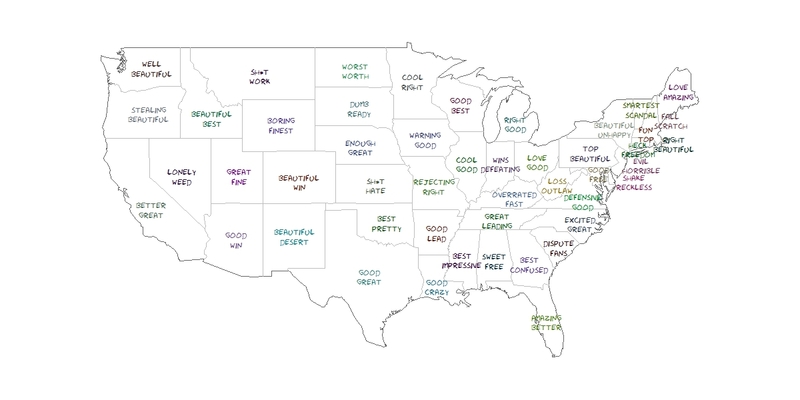 "Your tweet will appear here ..."
Since the right side of the map is a little bit messy, in the original post you can see a table with the couple of words describing each state. This is just an experiment to show how to use and combine some interesting tools of R. If you don’t like what Twitter says about your state, don’t take it too seriously.